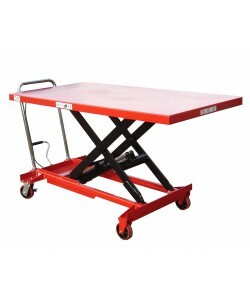 Lift tables or scissor lift tables, which ever name you call them by, these lift tables are ideal for handling and lifting extremely heavy or bulky items. Our range of stainless steel lift tables offer hygiene sensitive environments such as food factories or pharmaceutical plants ideal equipment for lifting and handling goods of various sizes and weights. 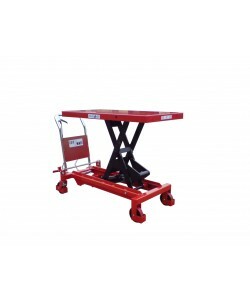 With the aim of improving operational efficiency and workplace safety the hydraulic lift tables are mobile and easy to use. 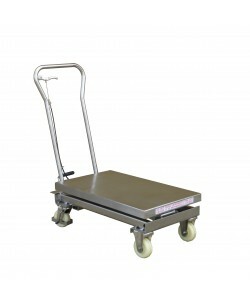 The SSL200 has a maximum weight capacity of 200KG and the SSL500, 500KG. 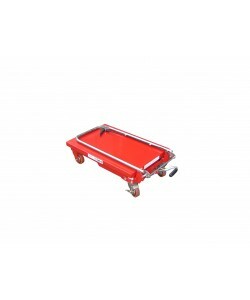 Rust and corrosion resistant even in the dampest of industrial environments, the lift tables provide a hygienic means to lifting and handling bulky items such as heavy loads of food ingredients for example. 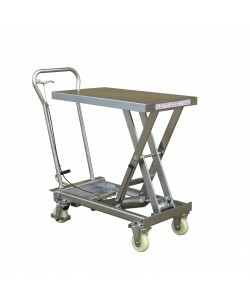 Produced to a high quality, the stainless steel hydraulic lift tables require little maintenance and can be efficiently and effortlessly cleaned. 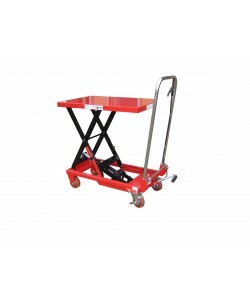 Easily handled and highly manoeuvrable the mobile lift tables are equipped with a stainless steel handle. Perfect for food manufacturing environments, the scissor lift tables are operated by foot pedals and can be supplied in many different sizes if required.